Newly built two bedroom & one bath vacation home with all the amenities wrapped up in a quaint cabin in our lakeside town. Open living area with dining and well appointed kitchen to make you feel at home. When time to unpack, choose either the main floor bedroom or the loft bedroom up the spiral staircase. The Living room has ample seating for everyone. Watch your favorite DVD from the reclining love seat. You and your company are never far away from each other as the open floor plan makes it easy to converse. 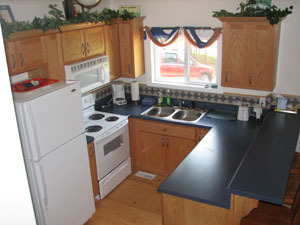 The kitchen is fully equipped with everything you will need during your stay except for the food of course. 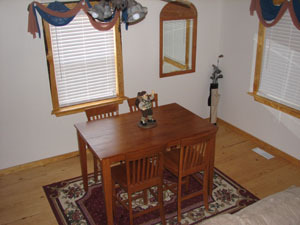 Table is ready for you to serve a great meal on, or to clear it off for a spirited game of cards or board games. There is additional seating at the kitchen counter if you have guest over. 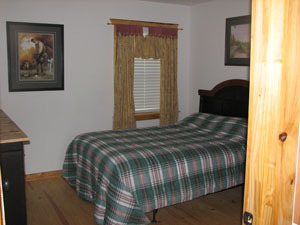 We have also added a large Trundle bed with plush twin mattress and a pull-out twin mattress below. We provide all the linens & towels during your stay. There is also an iron and ironing board. 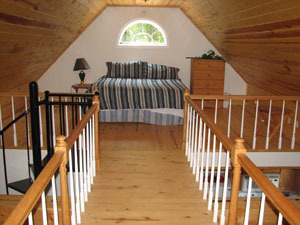 Follow the circular stairs up to this cozy room with a queen size bed located on the second floor in the loft area. 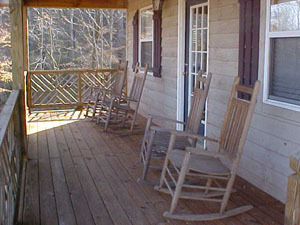 Enjoy the pond view from either one of the two covered porches while rocking your cares away. This deck is great the sitting or dining outside. The grill is right off the deck. 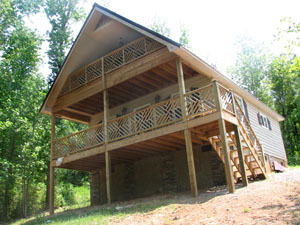 Newly built two bedroom & one bath vacation home with all the amenities wrapped up in a quaint cabin in our lakeside town. Open living area with dining and well appointed kitchen to make you feel at home. When time to unpack, choose either the main floor bedroom or the loft bedroom up the spiral staircase. 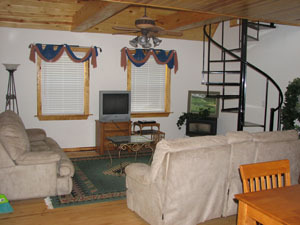 Enjoy the pond view from either one of the two covered porches while rocking your cares away. 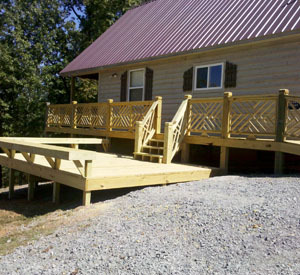 Your group will enjoy the newly added level walkway from parking behind the cabin and benched sun deck and cookout area. Watch your favorite DVD from the reclining loveseat or bring your horse to ride, hike the 30 acre property but don't forget your fishing pole to enjoy fishing in the stocked ponds (catch & release). This cabin is in a cluster of four, but still offers you plenty of privacy. 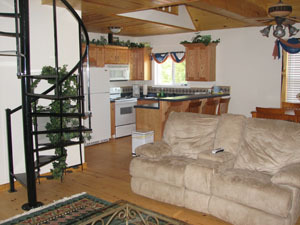 Receive a discount on golfing at Gunters Landing when you book this cabin. Lake boat launch access is just a few miles from this vacation getaway. A delightful, cozy and inviting place to stay! Lodging Tax applies to rental fee at 10%. Check in at 1:00 pm & check out at 11:00 am. Designed and Hosted by ProBass Networks Inc..